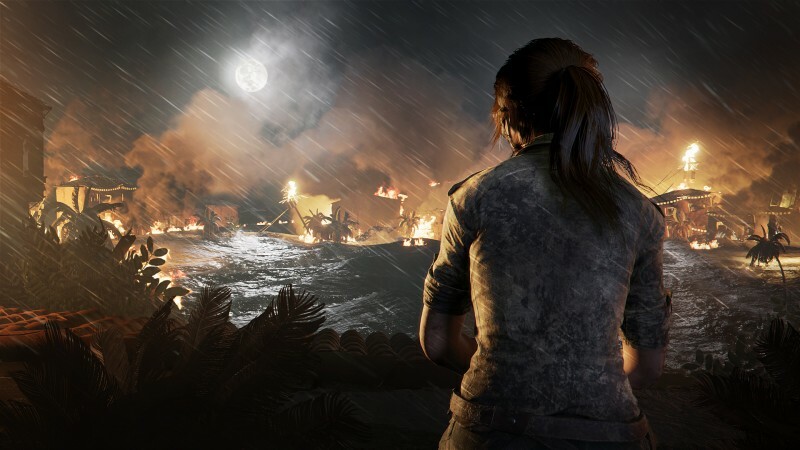 The Tomb Raider reboot has been about building up Lara Croft from a determined but inexperienced explorer to the hero we know today. 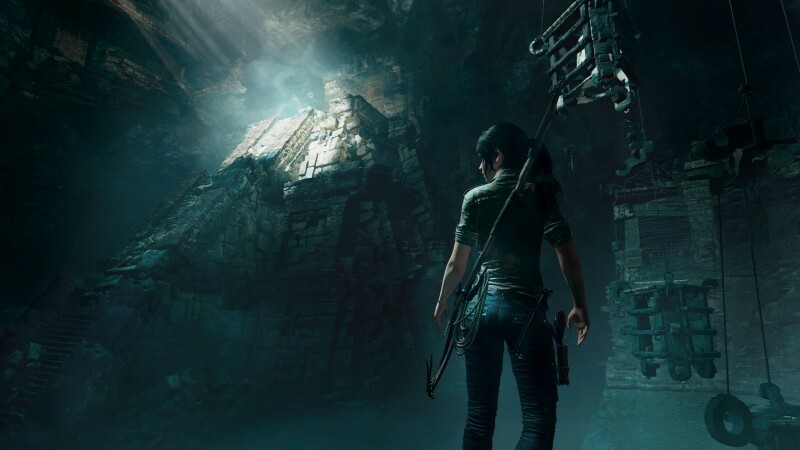 During our E3 demo of Shadow of the Tomb Raider, we got to play her as a full-on predator, culminating in a chilling scene that shows her confronting – and dismissing – any remaining fears or lingering insecurities. 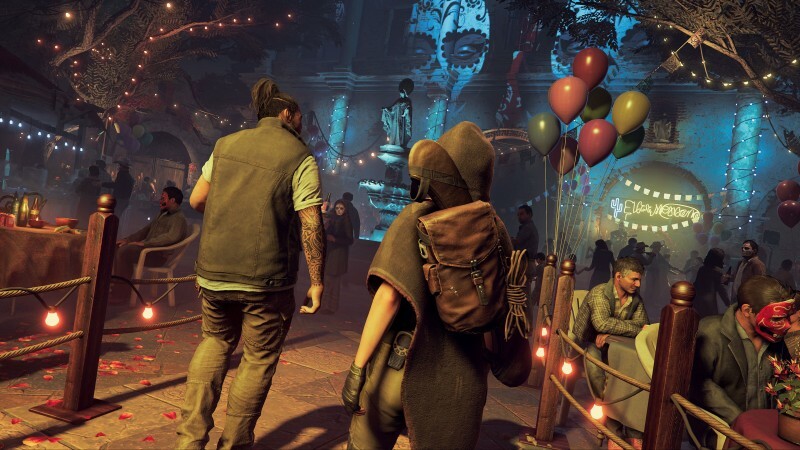 Unlike the last demo, which featured a gunfight that didn’t end until either Lara or her Trinity adversaries were dead, today’s demo was more flexible. It’s set in a Peruvian jungle, with multiple routes and paths to explore. 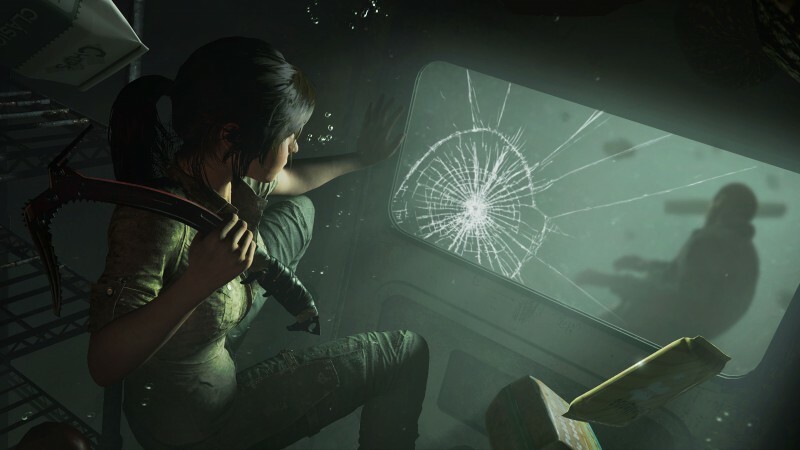 Lara moves through a dirt trail, as a radio crackles to live with a warning that “Croft is heading to your location.” She climbs a tree, and sees a trio of enemies below her. Jumping down and taking them out with her knife would be a dangerously stupid thing to attempt, so I draw my bow and fire a new fear arrow into the neck of the closest goon. The projectile hits its mark with a satisfying “Thwack!” and the victim looks around. He begins firing wildly at his comrades, clearly under its spell, taking them both out. A few seconds later, his panic turns to distress as he finally succumbs to the poison and hits the ground dead. It’s reminiscent of the berserk darts and similar toxins from the Assassin’s Creed games, but that familiarity doesn’t make the effects any less enjoyable. Ahead, I use the same tactic to eliminate a cluster of four enemies. The fear arrows are a limited resource, and they’re also not effective on armored enemies, so I take advantage while I can. 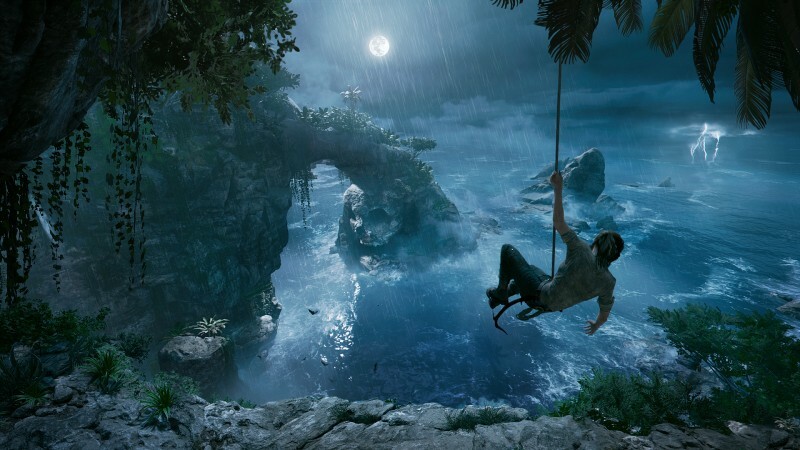 Lara is agile as ever, and climbing trees and getting the drop on enemies remains a solid approach. When a Trinity soldier gets too close to me on a patrol, I use a stealth kill that has Lara fire a rope arrow at him, drop from the tree, and string him up. I’m doing so well that I start to get a little cocky; I try to deactivate a generator while a guard is coming back, and he notices me – even though I stopped by a puddle a bit earlier and covered myself in mud. The fighters are aggressive and relentless. I try to juke their attacks, but it’s hard to avoid bullets with fancy footwork alone. I do manage to scramble away and backtrack to a vine-covered wall, where I can hide in its greenery. It’s enough to fool the guards into thinking I’m gone for good. That was a mistake. I find a gas can in an elevated spot, and throw it on the ground near several guards. They react the same way they do when I chuck bottles at them: firing blindly at the sound. It’s a fatal error, as their shots detonate the container and the explosion clears out the stragglers. Lara radios for her friend Jonah, and hears an unfamiliar voice. Jonah’s dead, the voice taunts, and his body can be found in the refinery. “I’m coming for you,” she replies. 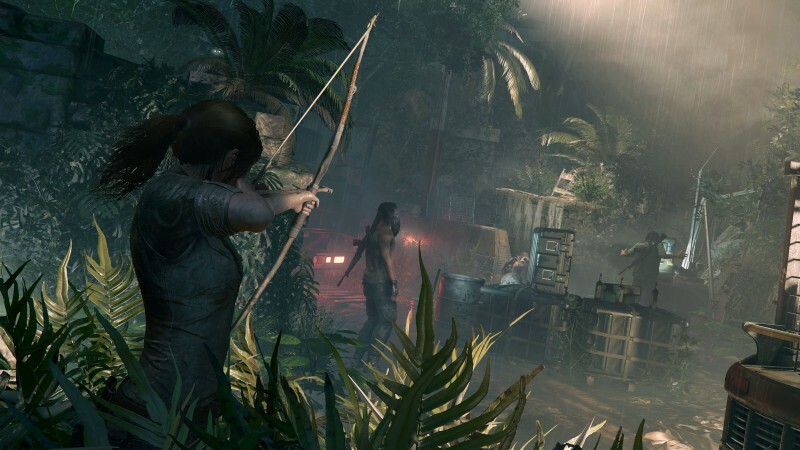 Lara moves past a gate, and the jungle gives way to a more industrial setting. Steel drums and vehicles are scattered along the path, which leads to the refinery. She’s midway across a bridge when a spotlight blasts on face, mounted on a helicopter. Stealth is no longer an option. An army of Trinity thugs open fire, and an extended platforming sequence begins. We’ve all seen the basic elements here before – collapsing catwalks, rails that bend and swing when grabbed, and death-defying leaps – but the graphical fidelity and effects from the now-flaming refinery keep it exciting. 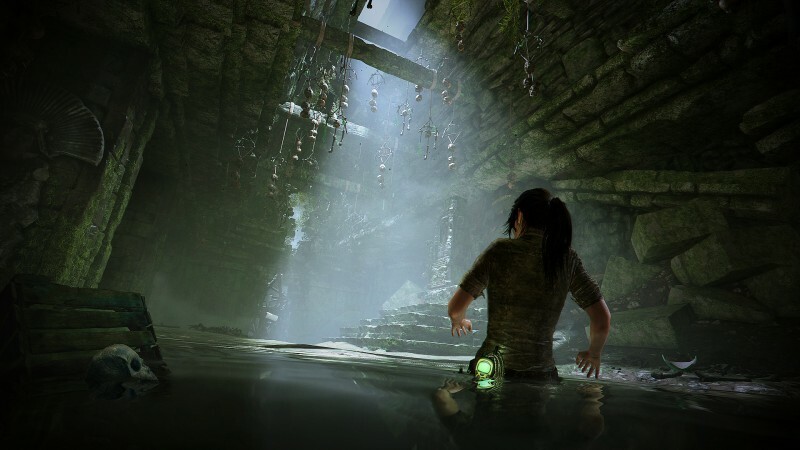 The demo ends with Lara falling into the water, and her body is limp as it sinks. 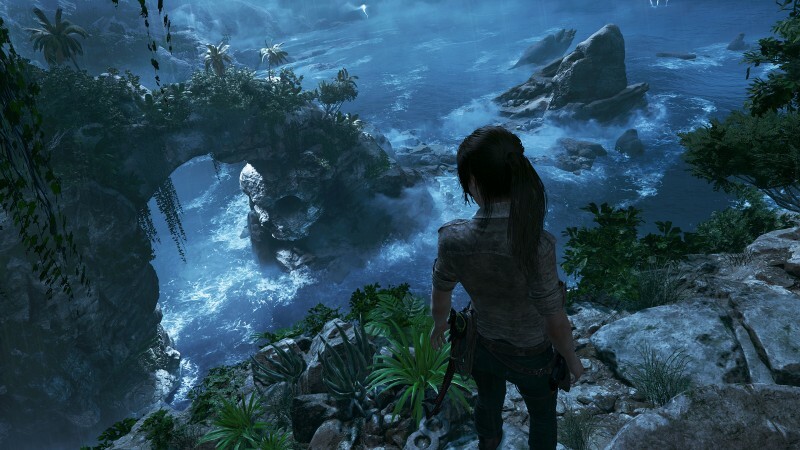 A montage of audio memories plays; people from her past and Lara herself doubt her resolve. But she refuses to give in. 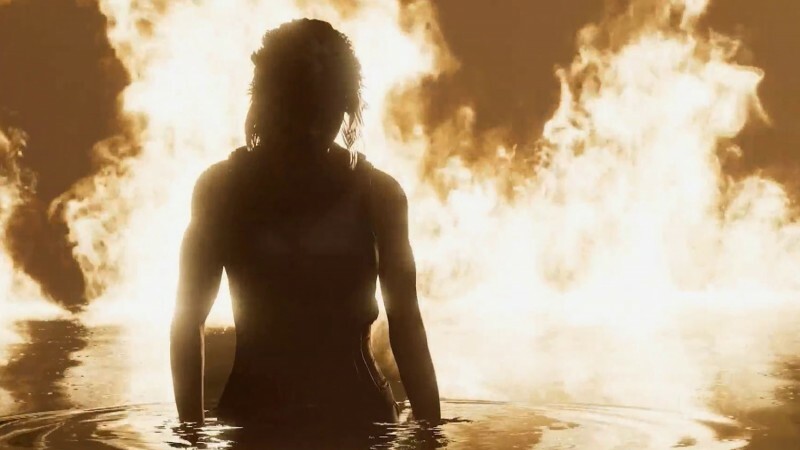 Her eyes open, and she slowly rises from the water, standing tall as walls of flame flicker behind her. 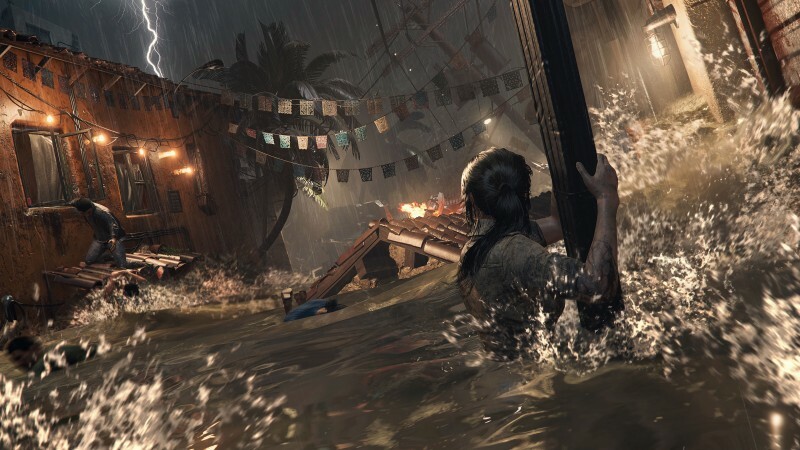 A wounded guard is on the dock, and Lara methodically bears down on him, knife ready. It’s a powerful moment, and the screen cuts to black before we see how it ends. I can only imagine it’s not going to be good for him, for Trinity, and possibly for Lara herself. 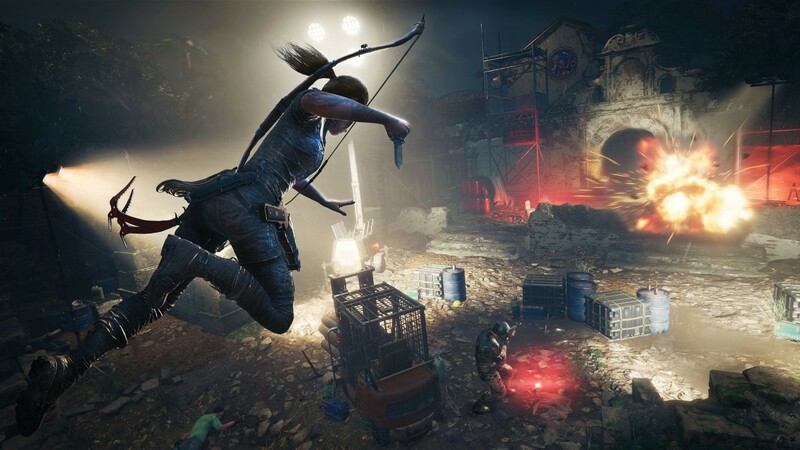 Look for Shadow of the Tomb Raider on PlayStation 4, Xbox One, and PC on Sept. 14.